So many options to consider! Tomato, cheddar broccoli, seafood chowders, potato bacon, even chili! The best part about going out to eat is asking the server what the soup of the day is and being excited about the answer no matter what is on offer. 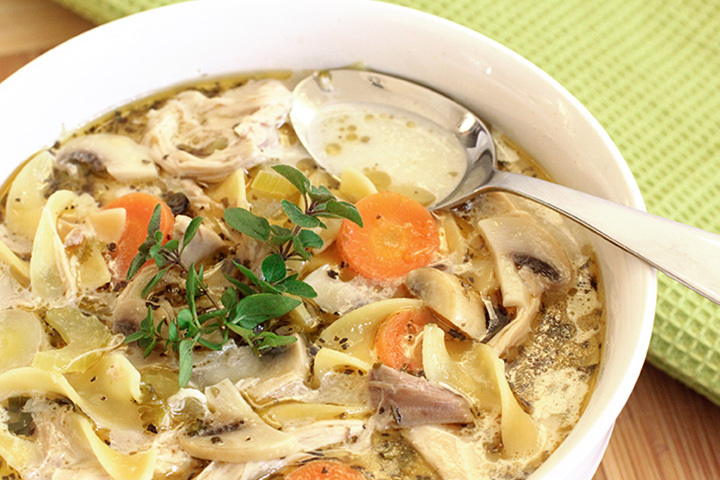 Soup just warms up the heart and soul, no matter the time of year. Dip in some crackers or warm bread…is your mouth watering yet? Here are the 10 best places for soup in Wisconsin! There’s a big reason to visit Houghton’s in La Crosse—their chicken dumpling soup is to die for. Order the soup and salad bar for an affordable price and eat as many dumplings as your stomach can hold. They are the perfect consistency and taste like heaven in your mouth. With five locations throughout Milwaukee, the Soup Market caters to all areas of the city. Check their website to see the “Soup Forecast” or what soups are on the daily menus for each location. The Market sells soup through catering, farmers’ markets, wholesale, and of course individually. Zoup! is just a clever place all-around. The website states Zoup! “Welcome(s) foodies and soupies to where love of great food and good company go hand in hand (And, spoon in hand).” Similar to breweries that offer flights of beer, enjoy a flight of soup at Zoup!. That means you can try several without pigging out on only one flavor. Dotty’s website sports a long list of awards and mentions the restaurant has received. Having served the Madison area for more than 40 years, Dotty’s has their soup recipes down pat. Enjoy a cup or bowl of the award-winning spicy hot chili, the classic jambalaya, or the soup du jour. Don’t forget to order some homemade corn bread for dipping. Red Light Ramen originally operated with a simple menu that offered only one item: tonkotsu ramen. Now after years of success and customer satisfaction that menu has grown to include more options for beverages and snacking. But still there’s only two main options for ramen: tonkotsu and mushroom miso. The Depot has been around since the 1970s and doesn’t plan on disappearing anytime soon. Order your homemade soup or chili in a cup, a bowl, or a quart—depending on how empty your stomach is. As a bonus the Soup Depot offers discounts to senior citizens, veterans, and college students. Daily soups are offered with hearth bread or asiago cheese bread. Then there’s the chili and chowder options as well to consider. Listed on their website, Pickerman’s offers broccoli cheddar, Wisconsin beer cheese, cream of chicken with wild rice, Sante Fe tortilla, vegetable beef barley, and—can you believe it—more. Have you ever eaten soup out of a bread bowl? If not, visit Jackson Harbor Soup and Sandwiches to enjoy the experience. The hot broth soaks into the bread, and as you eat the soup bread chunks can be torn off and devoured. Try Grammy’s Potato Soup, beer and cheddar soup or baked French onion soup to start off with. And don’t forget to go with the bread bowl. While the Coffee Grounds primarily serves soup during their catering operations, it may be worth your while to cater a party or get-together with The Coffee Grounds. The flavors they have available are tomato bisque, beet ginger coconut milk, chili, Thai carrot peanut, and tomatillo chicken. Our taste buds are already tingling. This place offers a unique experience: A combination of shopping and dining. There’s a gift shop, which offers home decor, gardening items, kitchen gadgets, and quilts. Then there’s a dining area where shoppers can eat a quick pick-me-up bowl of soup before heading out for some more retail therapy. Soup to Nuts is a must-visit.